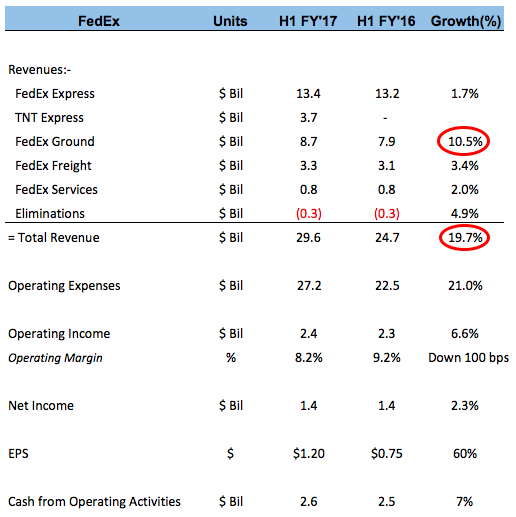 FedEx (NYSE: FDX) continued its strong growth in the first half of fiscal year 2017 (year ends May), with its revenues for the first six months increasing 20% year over year, primarily driven by the acquisition of TNT Express. In the same period, the company’s bottom line has improved marginally, though at a lower pace than its revenues. This is primarily due to integration-related costs from the TNT Express acquisition. The company’s net income per share increased 60% year-over-year (y-o-y) to $1.20. 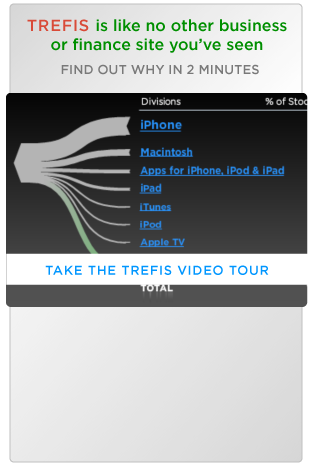 As a result of these factors, the company’s stock has risen 27% in the same period. In the past two quarters, FedEx has witnessed strong revenue growth in its product categories, primarily driven by growth in the e-commerce sector. FedEx Freight and FedEx Express grew a moderate 3.4% and 1.7%, respectively. The company’s acquisition of TNT Express, which was completed in May’2016, added an additional $3.7 billion to the company’s top line. Excluding the revenues of TNT Express, FedEx’s top line witnessed organic growth of 4.7%. The growth in the company’s top line has outpaced its expenses, and along with the continued low cost of fuel, the company’s operating income has grown moderately. FedEx Ground, the segment catering to the deliveries of e-commerce orders, continues to grow. In the six months of the fiscal year, FedEx Ground’s revenues increased 10% on a y-o-y basis, primarily due to an 11% rise in FedEx Ground’s revenues and a 8% rise in GENCO’s revenues. The segment’s average daily volume rose 7% y-o-y due to higher e-commerce demand, while the revenue per package increased 3% over the same period. FedEx has made significant investments to improve its facilities, which bode well for the company’s future. In the first six months of the fiscal year, the company’s capital spending was $2.7 billion, an increase of 4.6% over the same period last year. The company’s capital expenditures as a percentage of revenue were 9.1%, 130 basis points lower than last year. Moreover, the company completed 185 facility projects, including four major distribution hubs, 19 fully automated stations and 69 relocations. For the full fiscal year, the company expects its capital expenditures to be in the range of $5.6 billion, which would be 16% higher than its spend last year. The increased capital spending should help the company better cater to demand from e-commerce orders. Following the release of its second quarter results, FedEx released weak full year EPS guidance. On a GAAP basis, the company expects to generate earnings per share in the range of $10.95 to $11.45. The higher end of the guidance would represent 75% growth on a y-o-y basis, but the company’s guidance fell short of market expectations and resulted in the company’s stock dipping 3% post-earnings release.